To learn more about quick fixes you can make to appear more self-assured, we spoke to renowned body language expert, Jan Hargrave, whose book Strictly Business Body Language delves into the power of nonverbal communication and how anyone can use it to their advantage. If you’re slouched or crouched, it displays a lack of confidence and even a lack of sincerity. Stand up straight, push your shoulders back slightly and open up your chest. Be sure to keep your shoulders even. Unevenness of shoulders conveys indecisiveness in a person. Also, be sure to square your shoulders towards your speaking partner. We point our bodies where our mind wants to go. So if you are speaking to another, but your body is facing the door, it comes off that you would like to exit the conversation, and the person who you are speaking to may think you are discourteous or uncomfortable. Squaring off your shoulders towards your partner conveys a sense of interest and confidence. One of the biggest mistakes you can make is mindlessly fidgeting. This is a dead give away that you feel uncomfortable. Have you ever watched a professional newscaster? They never touch their face, adjust their ties, pull at their clothing or play with their jewelry. Because they have been trained to get you to believe what they are saying, and if they seemed nervous or insecure while delivering their message, you would not trust nor believe what they were saying. If you find yourself fidgeting, relax, stay present, fold your hands in your lap or on the top of the table in front of you. A simple hand gesture can make you appear more confident and secure. Many people are used to what is called the “fig leaf” gesture, in which one hand cups the other and rests over the groin area. But this hand gesture actually conveys insecurity and weakness. The hand steeple, in which the fingers come together to form a point, is a great alternative. When someone steeples in the chest area, it means they are confident about what they are saying. When someone steeples in the lap area, it means they are confident about what they are hearing. If you are having a one-on-one conversation, there is nothing more important than direct eye contact. Follow the 80/20 rule, in which 80% of the time your eyes are meeting your speaking partner’s, and 20% of the time, your eyes can be roaming as you gather information to say. Good eye contact not only allows your speaking partner to feel that you are interested in what they are saying, they will appreciate and respect you more for doing so and ultimately, associate you with a caring, confident individual. A good handshake can set the tone for your following interaction with another individual. The best handshake starts with you holding your hand in a vertical position, with your fingers together and your thumb extended upright. Then, when shake your partner’s hand, it must be a close, assertive connection in which the web of your hand meets his web. Be sure you approach their hand as evenly as possible. When someone’s hand is facing down, it means they want to control you. And if their hand is facing up, it conveys that they are submissive. If you want to go the extra mile to convey confidence, try “anchoring” the handshake. 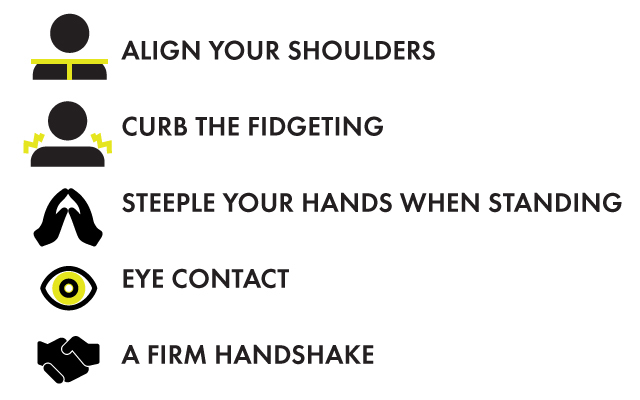 This means using your other hand to touch the person softly on their forearm between their wrist and their elbow. Done correctly, this move can give an impression that you are fully committed to speaking with the person. Just be sure to not go any higher than the elbow, as this could make the person feel like you are invading their personal space.